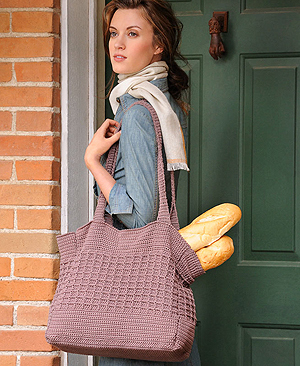 Gorgeous crochet tote fits all your valuables - or a picnic lunch! Skill Level -Advanced Beginner! Gorgeous patterns for Blue Sky Alpacas New Skinny Organic Cotton Yarn. Skinny Organic comes in 13 Colors - both low-impact dyed and Color Grown, or un-dyed natural colors. With names like Squash, Leaf and Sprout, these colors are the perfect yarn for lightweight cotton spring and summer projects.